A year-long adventure to raise the visibility of resources across continents began last August with visits to Ghana and Senegal. As a global organization, Hope For The Day aims to raise the visibility of mental health resources and eliminate stigmas across the world. Together, with our dedicated Agents of Impact, we can spread hope and teach communities that it’s ok not to be ok, no matter where they are. Our Hope Travels initiative explores the complex relationship between mental health and community while identifying stigmas and celebrating the diversity of self-expression. Through travels around the world, HFTD Agents of Impact build relationships with local organizations that are dedicated to forwarding mental health care and implementing proactive prevention. The Hope Travels journey began with Nancy visiting the country of Ghana. Accra, the capital, exemplifies Ghana’s spirit of collectivism and indomitability. However, in this society where everyone is expected to contribute, the stigma surrounding mental health is strong and deeply entrenched. It is only recently that people are willing to talk about their struggles and recognize that improving mental wellness is immensely beneficial for everyone within the society. Accra Psychiatric Hospital provided an insight into the importance of changing this stigma. Many of the patients there had been abandoned there by their families while others were found alone on the streets. For a number of them, they are not welcome anywhere other than this hospital and will spend the rest of their lives there. The therapy and medications for the patients is expensive, and unfortunately, the hospital struggles to secure funding from the government. Not only does the negativity surrounding mental health need to be dispelled, there also needs to be an increase in awareness of treatment and support options to help places like the Accra Psychiatric Hospital. Fortunately, many Ghanaians are more than eager to learn how to help. The collectivist spirit is apparent from the number of strangers that jump into action stopping crime and guiding lost foreigners. By sharing the Hope For The Day mantras it’s ok not to be ok, and we are in this together, Hope Travels presents mental health challenges not as incurable afflictions, but as normal and manageable. The idea of such struggles as something that anyone can face and conquer meshes perfectly with Ghanaian culture to encourage citizens to take action and break the stigma. One of the organizations in Ghana that Nancy coordinated with was Global Mamas. Global Mamas is a non-profit that supports small, woman-owned businesses in Ghana. The “Mamas” who own the businesses create high-quality handmade goods that are then marketed on Global Mama’s international store to boost marketing and sales. The organization’s focus on supporting working women and its occasional meetings and workshops provided the perfect venue for conversations on the importance of raising the visibility of mental health and positive self-care practices. The Autism Compassion Institute (ACI) was another opportunity Nancy found in Ghana to facilitate a change in how mental health challenges are viewed. ACI creates individualized curricula for each student to increase their growth and independence. One of the critical messages Nancy pushed during the visit at ACI is the importance of self-care, especially for the teachers that work so hard to ensure their students’ wellness. It is common for caretakers to ignore their own needs while looking after others. But no matter who you are, it is ok to take a break or ask for help sometimes. Mental health has no prejudice and can affect anyone at anytime. PsychAidLove is proof of the changing perception of mental health. While visiting the Impact Hub, a co-working space dedicated to supporting NGOs and nonprofits in Accra, Nancy discovered PsychAidLove. The newly founded group hosts free quarterly breakfasts where locals can talk with mental health professionals from the city. Providing a safe space for conversations on mental wellness is exactly what Hope Travels is working to emulate around the world. After an extended stay in Ghana, Nancy visited the country of Senegal. One group Hope Travels worked with that deserves the spotlight is the “Happiness Team” at a children’s cancer center in Dakar. Such a place was emotionally challenging for Nancy and undoubted a far greater burden for the children and their families. Each week, the Happiness Team donates their time and money to brighten the mood. They carry in candy and tea, but they bring far more than that: a happy respite from the gloomy hospital walls, a willing shoulder to cry on and a vast array of children’s songs and other entertainment. The Happiness Team visit was a short portion of the travels in Senegal but left a lasting impact. Teranga creates a sense of closeness within the community that is rare in the United States. By keeping their doors open, support or simply a friendly face is always accessible in Senegal, even to newcomers who cannot speak French, like Nancy. Being open and friendly to honest conversations is a guiding principle shared by the Senegalese and Hope For The Day. Since one of the highest risk factors of suicide is the silence of stigma, there is real value in talking about mental health to release mental and emotional pressure before it builds. 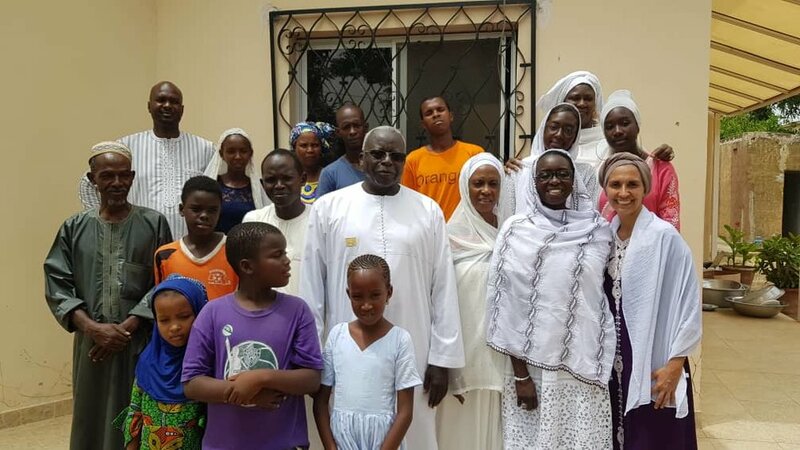 Using the concept of Teranga to facilitate healthy conversations about mental health, we hope that any house in Senegal can be a resource for people in crisis. Next week will be the second entry into Nancy’s Hope Travels journey so far, covering her visits to Rwanda and Ethiopia. Learn how you can get involved, in your community or around the world, by visiting our website or by emailing us at takeaction@hftd.org. Learn more about Hope Travels on our facebook page.